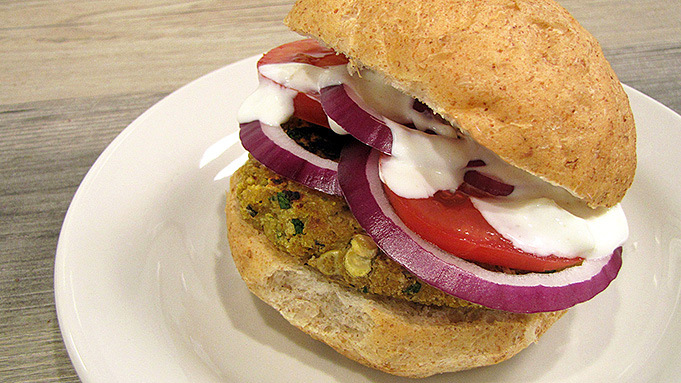 This publication provides background on making freezer meals featuring pulse recipes. Pulses are the nutrient-rich seeds of legumes and include chickpeas, lentils and dry peas. They are a staple in the diets of many people living in the Mediterranean area, India, the Middle East, Africa, Australia and South America. U.S. production of pulses has been increasing since 1990. Pulse foods can be used in burgers, soups, salads or trail mixes. Pulses can be ground into flour to add protein and fiber to mashed potatoes, pizza crust, pie crust, ice cream, pasta, crackers and breadsticks. Chickpeas are pureed to make hummus, a nutrient-rich spread that is paired with pita chips or cut vegetables. This publication provides information about make-ahead meals with pulse foods. For evidence-based see information, recipes and videos featuring pulse foods. 1 cup of cooked pulses equals 1 cup of vegetables. Pulses are an excellent source of fiber and folate and a good source of protein and iron. They also are gluten-free and a low-allergen food. Chickpeas are very low sodium and low fat. 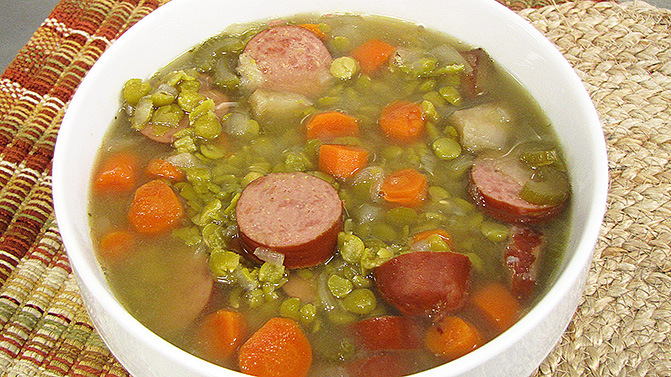 Peas and lentils are fat- and sodium-free. Lentils are an excellent source of antioxidants. Pulses can count as a vegetable or a protein food on the U.S. Department of Agriculture (USDA) food guidance system, MyPlate. Nutrition experts recommend consuming 2.5 to 3.5 cups of pulses per week. Freezer meals are the product of a process known as “freezer cooking.” You invest some time up front to save time later. You can prepare a variety of delicious meals that will feed you or your family for two weeks to two months. Meals are prepared assembly-style, packaged, labeled and frozen. Assembly-style processing saves you time. Instead of chopping one onion for each recipe, you might chop 10 onions at one time for use in multiple recipes. Buying ingredients in bulk may save you money. Compare unit prices (price per ounce) on larger-sized food packages vs. smaller containers. 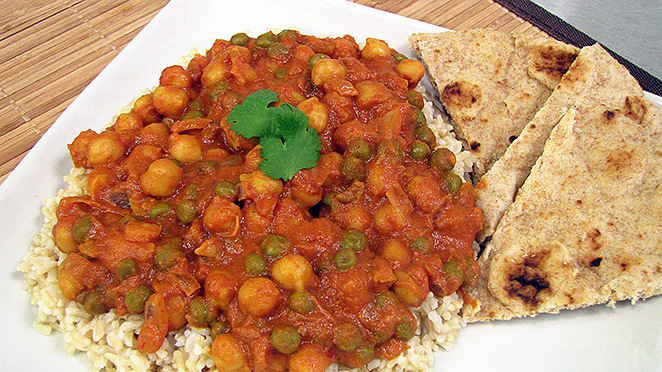 1/4 cup of cooked pulses equals 1 ounce of protein. When you have ready-to-cook (or reheat) meals in your freezer, you are less tempted to go out to eat. Meals eaten away from home often are more expensive and less nutritious than home-prepared meals. Simply remove a package from the freezer the evening before you plan to use it, thaw in the refrigerator and reheat or cook. Even if you have a small freezer, freezer meals still can be an option for you. By freezing meals flat, you can store about two weeks’ worth of meals in a refrigerator-top freezer. After meals are frozen, you can reorganize them so they are stacked vertically like a bookshelf if your freezer allows. If making freezer meals is new to you, start small and gradually increase the number of meals. Try a few meals that you know your family will eat, or try out a plan for two weeks’ worth of evening meals if you feel ready. The complexity and the number of recipes will determine how long preparing freezer meals will take you. As you gain more experience, you will become more efficient at preparing them. Choose the days you will be able to complete your freezer cooking session. You will need time for a partial day of shopping and several hours for preparing meals, depending on how many you choose to make. Think of your family’s favorite meals. Review other recipes you have found; compare nutrition. Decide on the entrées you are going to make and locate all of the recipes. Be sure to have your family’s schedules in front of you as you plan menus to remind you of evening events where you will be eating out. Write your entrée selections on a blank menu calendar, filling in one entrée per day, or use menu-planning software or apps. Be sure to have all of your recipes in front of you while creating your grocery shopping list. Once you have your completed list, cross off any ingredients you already have on hand. Make sure to note the total amount of ingredients you will need from all recipes. Don’t forget to add freezer bags to your list. If you prefer, use menu-planning software or apps to generate a shopping list automatically. Read the grocery store fliers for your favorite stores. Make note of the best meat and poultry specials; protein foods tend to be the most expensive. Using your shopping list, purchase the foods you need and store them properly prior to preparation. For example, use fresh, refrigerated meat within a couple of days of purchase. Gather your recipes. Group recipes with common steps, such as browning ground beef, and chopping and sautéing onions. Plan the order of your recipe preparation. Using a permanent marker, label freezer bags with the name of the recipe, cooking directions and date before you start cooking. The bags are easier to write on when they are empty. Another option is to print the recipe name, date and directions on mailing labels. Freezer containers can be used in place of freezer bags. Perform all chopping, slicing, crushing and grating tasks. For example, chop all of the onions and brown all of the ground beef you need at one time. If you have special appliances, such as vegetable choppers or a food processor, use them to speed your preparation. Place food in meal-sized amounts in freezer bags or freezer containers. If using freezer bags, freeze the bags flat for easy stacking. Lentils, dry peas and chickpeas can be the main protein source in a freezer meal entree or can complement an animal protein such as ground beef, chicken or pork. 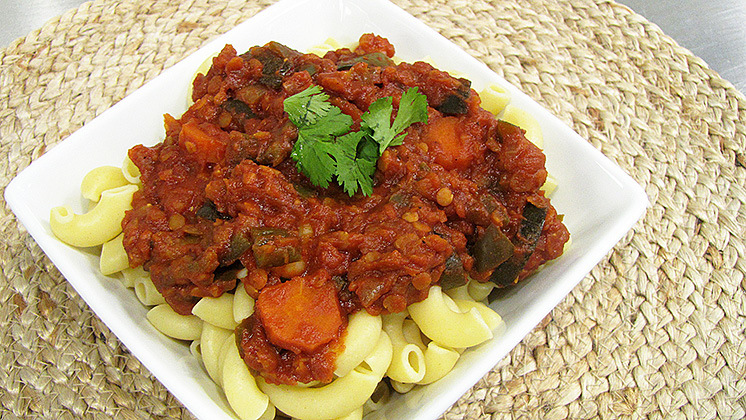 Many freezer meal recipes pair pulses with chopped vegetables and sauces. 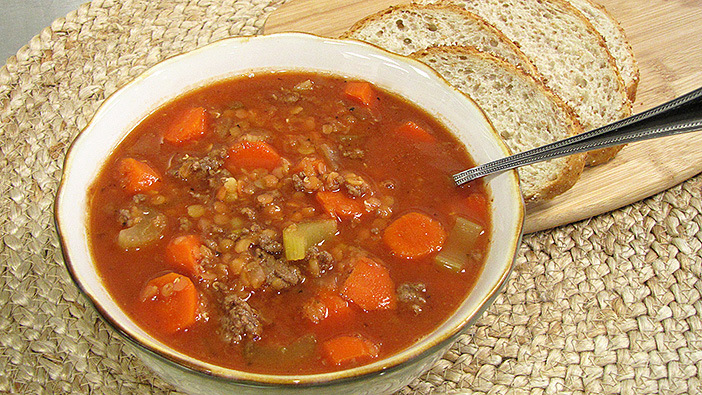 Soups and stews are easy-to-make freezer meals. Once prepared, these entrees can be served with rice or pasta and additional vegetables or fruits to make a full meal. You also can cook batches of lentils, peas or chickpeas and freeze them in single-serving or meal-size portions. Pulses that are firmer after being cooked will freeze better than those cooked to a soft texture. 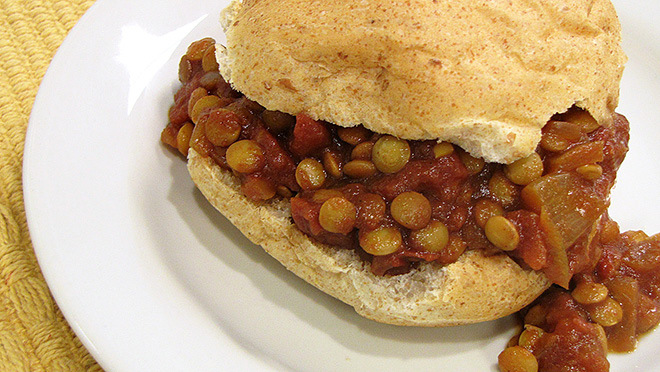 Be sure to remove as much moisture as possible before freezing by patting cooked pulses with a dry paper towel. Pulses can be stored in a plastic bag in a single layer or in a glass or plastic container. A container may work better for storing dry peas because they become a puree when cooked. If stored in glass containers, they can be reheated easily in the microwave when you are ready to use them. If stored in a plastic bag, place in the refrigerator the night before you want to use them to thaw. Choose freezer-friendly foods. Casseroles, soups, stews, chili and meat loaf all freeze well. Certain foods will not reheat well after being frozen. Lettuce, watermelon and tomatoes will become limp. Cooked potato chunks will become gritty. Fully cooked pasta may be mushy. Gravies and some dairy products such as cream or milk will separate when frozen. Cooked eggs may become rubbery. Cool cooked dishes quickly before freezing. Place food in a shallow container and refrigerate uncovered until cool. You also can place a container in a bed of ice water to cool it faster. Avoid freezer-burn by using a freezer zip-top plastic bag and making sure to remove as much air as possible before sealing. Storing food in smaller quantities allows it to freeze more quickly and gives you the ability to take out only what you need. Use a permanent marker to label all food that goes into the freezer so you know what it is. Include a use-by date. Most entrees will maintain their quality for about three months from the date they were prepared. Add any preparation steps needed to cook the food. That way you don’t have to dig for the recipe when you are ready to cook. Freeze food quickly. For best quality of your frozen foods, maintain freezer temperature at 0 degrees F or lower. The quicker the food freezes, the better the quality will be when it thaws. When freezing the food, arrange the containers in a single layer so air can circulate and help the food freeze quickly. After the containers are frozen, you can stack them. Thaw frozen food in the refrigerator. Thawing foods at room temperature increases the risk of foodborne illness because bacteria grow well at room temperature. Note: Some freezer bags are safe to microwave, while others are not. Be sure to read the information on the box of bags to see if they are safe to microwave. If you are not sure if the plastic is safe to microwave, remove the food from the plastic bag and place in a microwave-safe container. Cook the chicken, vegetables and garlic until cooked through. Cook lentils. Add the lentils, curry paste and coconut milk. Stir to combine; season to taste. Let cool completely in shallow pans in the refrigerator. Place in a labeled freezer bag, flatten and freeze, or divide into single-serving freezer containers if desired and freeze. From frozen, microwave for four to 4½ minutes, stirring occasionally. 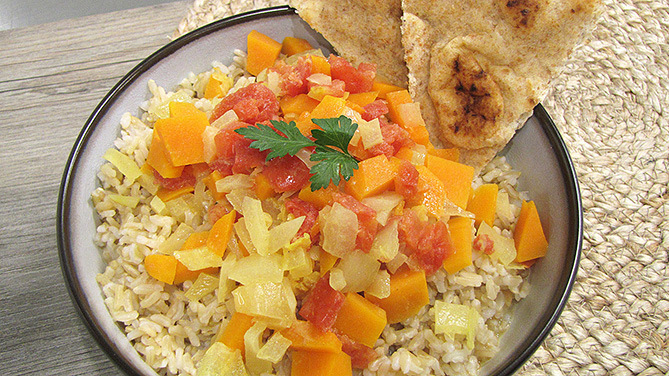 Serve over rice or with naan (flat bread). Makes five (1-cup) servings. Each serving has 270 calories, 12 g fat, 25 g protein, 17 g carbohydrate and 270 mg sodium. Cook lentils according to package directions. Drain well. Spray a pan with cooking spray or use a small amount of oil; add onions and cook until soft. Add curry powder; stir until fragrant. Cool mixture slightly. Place chickpeas, half the lentils, ginger, egg and onion mixture in food processor bowl. Process 20 seconds or until smooth. Transfer to a bowl, stir in remaining lentils, parsley, cilantro and bread crumbs; combine well. Divide mixture into 10 round patties. Note: If mixture is too soft, you can refrigerate for about 15 minutes or until you can handle the mixture. Place patties on hot, lightly greased grill. Cook three to four minutes on each side or until browned, turning once. Serve immediately or allow to cool, wrap with plastic, then foil, and freeze. To serve, remove packaging. Reheat in the oven, microwave or in a pan on the stove until warm throughout. Serve with your favorite burger toppings. Makes 10 servings. Each serving has 170 calories, 2.5 g fat, 8 g protein, 30 g carbohydrate, 4 g fiber and 530 mg sodium. Tip: If you need to add broth at cooking time, be sure to write a reminder note on the freezer bag. You also can add the broth at the time you place the food in a freezer bag, but that will take up more space in your freezer. To freeze: Prepare vegetables as directed. Add all ingredients except onion and sausage to a labeled freezer bag. Brown kielbasa sausage and diced onion in 1 tablespoon oil, drain fat and let cool completely before adding to bag. To cook: Remove from freezer and place in refrigerator overnight to thaw. Pour contents into a slow cooker along with 6 cups chicken broth. Cook on low six to eight hours on high three to four hours. To serve: Serve with fresh bread. Makes 11 (1-cup) servings. Each serving has 230 calories, 7 g fat, 14 g protein, 26 g carbohydrate, 8 g fiber and 580 mg sodium. To freeze: Cook lentils according to package directions. Prepare vegetables as directed. Add ingredients to a labeled freezer bag. To cook: Remove from freezer and place in refrigerator overnight to thaw. 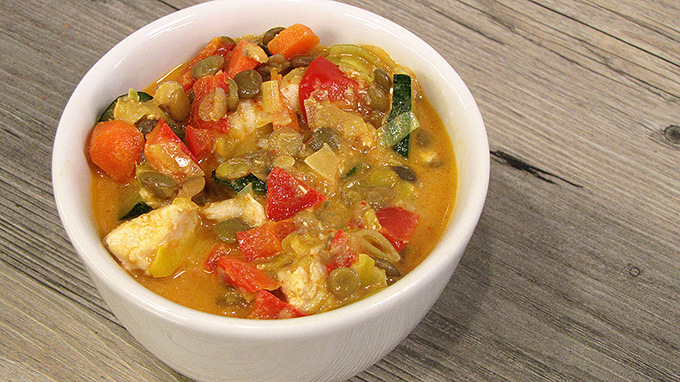 Pour contents into a slow cooker along with 1 to 1½ cups chicken or vegetable broth. Season with salt to taste. Cook on low six to eight hours. To serve: Serve over cooked pasta. Makes four (1-cup) servings. Each serving has 220 calories, 2 g fat, 12 g protein, 44 g carbohydrate, 11 g fiber and 310 mg sodium. Tip: To reduce sodium in your recipes, choose reduced- or low-sodium broth, soup base and/or canned tomato (or other) sauce. To freeze: Cook lentils according to package directions. Chop vegetables. Add all ingredients except ground beef and onion to a labeled freezer bag. Brown the beef and onion in a skillet; drain. Let cool completely before adding to the freezer bag. To cook: Remove from freezer and place in refrigerator overnight to thaw. Pour contents into a slow cooker along with 1 quart broth. Season with salt to taste. Cook on low eight to 10 hours. To serve: Serve with whole-grain bread or crackers. Makes 12 (1-cup) servings. Each serving has 200 calories, 2 g fat, 17 g protein, 28 g carbohydrate, 6 g fiber and 410 mg sodium. To freeze: Prepare ingredients as directed. Add ingredients to a labeled freezer bag. To cook: Remove from freezer and place in refrigerator overnight to thaw. Pour contents into a slow cooker. Cook on low six to eight hours. Season with salt and red pepper flakes, as desired. To serve: Serve over rice or pasta. Makes six (1-cup) servings. Each serving has 370 calories, 16 g fat, 12 g protein, 49 g carbohydrate, 10 g fiber and 350 mg sodium. To freeze: Cook lentils according to package directions. Chop vegetables. Add ingredients to a labeled freezer bag. To cook: Remove from freezer and place in refrigerator overnight to thaw. Pour contents into a slow cooker along with 1 cup water or broth. Cook on low five hours or until lentils are tender. To serve: Serve on whole-wheat buns or bread. Makes 14 (¼-cup) servings. Each serving has 90 calories, 0.5 g fat, 4 g protein, 18 g carbohydrate, 3 g fiber and 190 mg sodium. To freeze: Cook lentils according to package directions. Prepare vegetables as directed. Add ingredients, except broth, to a labeled freezer bag. To cook: Place in refrigerator overnight to thaw. Pour contents into a slow cooker. Add 1 quart chicken or vegetable broth. Cook on low six to eight hours. Season to taste. To serve: Serve over rice. Makes 10 (1-cup) servings. Each serving has 270 calories, 10 g fat, 14 g protein, 32 g carbohydrate, 7 g fiber and 150 mg sodium. Special thanks to Stacy Wang for her assistance with preparation and photography of the recipes. This project was made possible in part with funding from the Northern Pulse Growers Association.